Interested in exploring Dublin’s music scene during your stay? Byrne, one of our Student Ambassadors, offers his thoughts on where to go to get your fill of live music this summer. “In my experience, live music is truly a cornerstone of Irish culture. Musicians, back in the time of Brehon Law, were held in the third highest regard in Irish society, next only to the Poets and the King (Rí). During the Protestant Ascendancy, Irish music was taken from the courts, and into the home. This resulted in the music mentality that has permeated Irish culture to this day. It has manifested in the form of Trad (traditional) sessions – gathering, sharing, and appreciation of live music – a long time custom in the typical country Irish home for the past centuries. Nowadays, live music is still just as prolific about the city, with venues ranging from huge stadiums, to small traditional pubs. The Three Arena is the go to large venue for touring artists. Dublin is typically a must stop location for all the biggest touring acts. We recommend checking ticketmaster.ie to see if your favourite superstar is making a pit stop in Dublin – they probably are! The Three Arena is super accessible – at the end of the Red Luas Line in the docks, east of the city. It can be absolutely packed, as the amphitheatre holds up to 15’000 people. Croke Park is the giant. It is usually a year round GAA (Gaelic Athletics Association) stadium, hosting the Hurling and Gaelic Football inter-county competitions. But from time to time, the 82’300 capacity stadium is transformed into a mega amphitheatre. Music giants like U2, Take That, and Red Hot Chili Peppers have filled out the stadium, inducing an electric atmosphere. Again, look out for touring artists on ticketmaster.ie. The Academy is the smaller sister of the Three Arena. It sees smaller touring acts, including many DJs and general Dance Acts and club nights. It is located on Abbey Street, just before Jervis Shopping Centre. Vicar Street is a multi-functioning venue, hosting a plethora of comedy, dance and music acts. It is a very personal-feeling venue, with good audience-performer engagement. Vicar Street can be found just past Christchurch, on Thomas Street. The Olympia is a charming old theatre, built in 1879. It is full of character, able to maintain an intimate atmosphere, whilst also able to hold a large enough audience. Medium size touring Artists often do gigs in the Olympia. 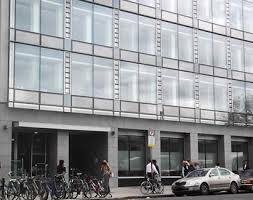 It is located on Dame Street – straight out of the Front Gate exit from Trinity. Whelan’s is the quintessential “gig” location. There is live music here almost every night. The performers range greatly between international touring acts, Irish popular and alternative acts, and Irish traditional acts. Whelan’s has a lively ambiance, offering a unique live music experience. Artists as big as Ed Sheeran have played this small, iconic venue (with exceedingly high demand) just in order to experience the atmosphere themselves. Foggy Dew is a more traditional Irish Pub and Music venue. Here, you will find Irish Pub culture, inextricably linked with the Irish Music tradition. A blend of Irish Trad and Alternative is played in session style every evening. The venue is open and spacious – good for sociable gatherings, with friendly bar staff, accompanied with live music. The Workman’s Club is, first and foremost, a bustling club night that Trinity students flock to on Wednesdays. Every other night of the week, the Workman’s serves as an intimate gig setting for up and coming alternative and rock acts. If you are particularly interested in obscure or new bands, keep an eye on who is playing the Workman’s circuit. There is a chance that you are witnessing the next big act to emerge from Ireland! District 9 has a warehouse feeling, tucked away in a suburban/residential part of Christchurch. It is often home to alternative and electronic gigs, with Trinity’s own Ents Officer using it as a venue for Trinity nights out. These are typical “club and DJ” nights, great for dancing! To give a flavour, Bakermat played this venue in the college’s official end of year party. The Twisted Pepper is your go-to dance venue. It sees an array of EDM, drum-and-bass and alternative dance acts every weekend. It is a sure-fire locations for some heavy bass and dance beats. It has typical stage area upstairs that has hosted the likes of Flume and What So Not. In addition, it has a low-ceilinged basement where you can dance until the early hours. The Twisted Pepper is an experience worth trying – particularly for those with light feet. The last time I wrote a blog post I was looking back on my Erasmus in Paris; and now, all of a sudden, I’ve graduated and I have a whole degree to reflect on. For the past year I’ve been focused on a dissertation, academic essays and job applications. And, although this year has been busier and possibly more challenging than my previous three here, I’m still inclined to say that my final year was the best. Yes, at times it was quite stressful. And yes, my coffee addiction did increase until I couldn’t function without at least five Americanos per day, but in this final year everything came together and I gained a new clarity on why, four years later, I’m so happy that I came to Trinity. This university has a strong academic reputation for a reason. It takes high grades to secure a place here and that standard is maintained throughout your degree. At first it can be tough. A relatively high-achieving high school student can arrive at Trinity and discover that they’re one of many, that by Trinity standards they’re ‘beautifully average’. However, this type of learning environment really does encourage you to do your best. Students from different academic backgrounds and majors bring additional knowledge and insight to a lecture that might not necessarily have been covered. However, what really makes Trinity stand out is its focus on the student as an individual, and not just their academic ability. You’re actively encouraged to join the many different student societies and sports clubs, to get involved with the Students’ Union (the oldest Students’ Union in Ireland) and to volunteer with the numerous charities. 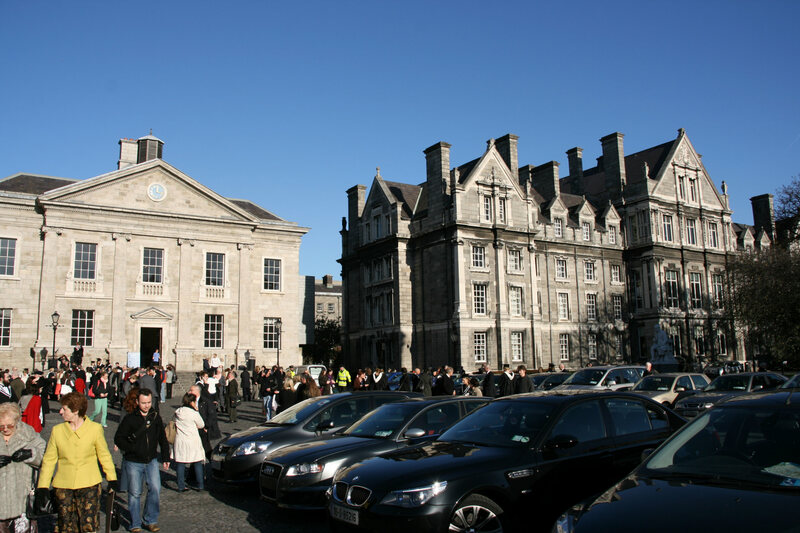 Additionally, the campus is located in the heart of Dublin city. Instead of a self-contained university town Trinity is connected and involved with the local community. The university hosts multiple events each year, such as last week’s Dublin Maker and the upcoming Discover Research Dublin, giving students the opportunity to get involved in new projects. Ironically, Trinity wasn’t on my original list of choices. Despite the status of the university it wasn’t until I came to visit it that I could appreciate what a great opportunity it would be to study here. What was a last minute change-of-heart, rushing to re-write my applications and beat the deadline, turned out to be one of the best decisions I’ve ever made. 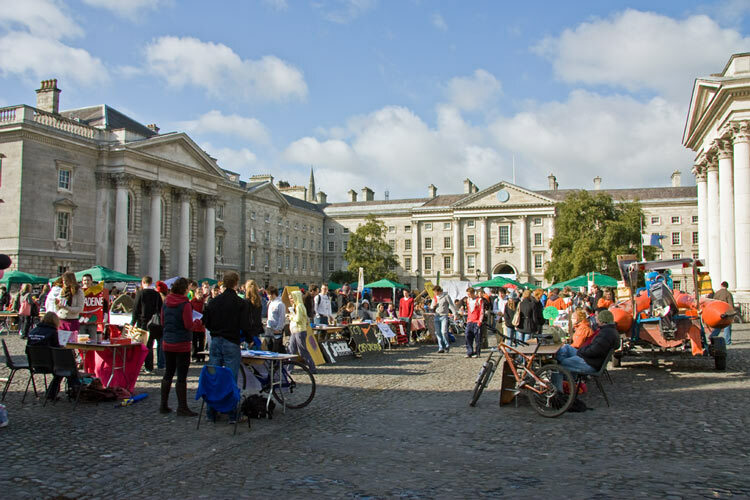 One of the many benefits of being an international student at Trinity College Dublin is that you have the pleasure of being under the care of the Career Advisory Service within the University. The centre has many workshops, including one that I attended called “Finding work in Ireland”. This particular workshop attracted my attention because, a few years into a degree in Trinity as a foreign student, I started to wonder how I could make myself appealing to employers when there are other thousands of other Irish and international students. I attended a four week course where I met with a group of international students in one of the rooms in the Career Advisory Building. We learnt about: how to write CVs and cover letters, how to perform well in interviews, and the ways in which you can use LinkedIn to your advantage. These workshops were targeted specifically at finding employment in the Irish market, and we were under the care of a very helpful careers advisor. The most important information that I gathered from this workshop came in the first part, “the eligibility to work in Ireland” (something I had never thought about before I attended the workshop). I had always been concerned about having a correct CV and cover letter, when I should have known more about my rights to work in Ireland and the conditions that I must obey to work here. There is no point in having a perfectly set up CV and cover letter with good grades if I, or my future employer, do not know about whether I can work in Ireland. Some Irish employers may not know if foreign students, and especially non-EU students, can work in Ireland; therefore I think it is always good to know your rights and explain them to the interviewer in case they have any doubts. I learnt a lot in this first section of the workshop and found it very helpful and insightful. Another workshop taught us how to write CVs and cover letters, something very familiar to most students. Interview technique was something I found tricky, so the careers advisor gave me advice on how to improve this skill. Many students with similar degrees are likely to get identical grades, so most are interviewed by their potential employer. This is a crucial chance to stand out from the crowd and show the interviewer your unique skills, abilities and ambitions. Being interviewed can make some people very nervous, so the workshop helped us learn how to handle the pressure. Learning how to perform at interview in theory is very different to putting what you’ve learnt into practice; however I found the information from this workshop was effective and beneficial when I was applying for internships. One of the current trends when finding work is to use “LinkedIn” (which many students find unfamiliar), therefore the highlight of this overall workshop for me was to learn how to use LinkedIn. Employment trends are moving away from old fashioned CVs and cover letters, towards online-based recruitment (which can be done efficiently through LinkedIn). We were instructed by an experienced careers advisor on the use of LinkedIn, how to use it and what to write. Overall I found the various aspects of the workshop “Finding work in Ireland” incredibly useful. The careers advisor who ran the classes was very helpful and insightful, and I now feel in a much better position to pursue employment in Ireland. My first thoughts around hitchhiking in Ireland took place in December two years ago on a trip to the west of Ireland with my friend Maria. Part of the holiday involved travelling from Galway to Letterfrack, a gem of a town hidden away in beautiful Connemara, on Christmas day. Considering the difficulty of getting there by public transport at that time of the year, the brave Maria suggested to the not-so-brave Panpan that perhaps hitchhiking would be the best solution. Before we intended to set out on the road, an elderly gentleman we met on the streets of Galway on Christmas Eve imparted some sound advice. He strongly discouraged us from hitchhiking, saying that it was “too dangerous”, as I had previously feared! He went on to explain, in his strong Galway accent: “The law has changed. Now if there is a car accident, the person who picks you up will be responsible. Since this change, drivers are less likely to pick up hitchhikers. You can stand on the street for ages without anyone picking you up. It is so cold now. You might catch a cold.” That sounded extremely dangerous, and Maria agreed with him and comes from Moscow and is fully aware of the danger of a winter day, even in Ireland. So we decided to postpone the hitchhiking plan for some day in the future, a warm future. So we ended up staying in Galway for an extra day then taking the bus to Letterfrack. The first hitchhiking experience in my life happened several months later, unsurprisingly, on a summer day, as I had the Galway man’s advice nailed into my brain. I was travelling in the Beara Peninsula in west Cork with two others. We booked our accommodation at a Buddhist retreat centre situated on the top of a mountain in the Beara Peninsula in West Cork. As we were walking uphill, a car stopped by and the driver asked us if we need a lift. We gladly accepted his kind offer and it became my first “hitchhiking” experience. So happy were we that we forgot to take the bag of food we purchased at the shop in town. The next day, after touring the Beara Peninsula, we were walking uphill again. The same car passed by, and the driver said to us: “Jump in!” So we miraculously recovered our lost bag of food! My first real “hitchhiking” experience came the next day. We needed to travel from the Beara Peninsula to Allihies. We made the journey only by hitchhiking – we were picked up many times, by people of different genders, age groups, and professions. The law might have changed, but the cavalry spirit of the Irish people in the west coast obviously has not. It was difficult to draw a profile of these kind-hearted people as they all came from very different backgrounds. Thanks to them, we were able to reach some of the most beautiful hidden spots in Ireland which were not easily accessible through public transport. In addition, we were able to learn some local knowledge and funny anecdotes along our way. I did a recent trip to west Cork again, and again I was offered a ride. I still would refrain from encouraging travellers to hitchhike, especially those travelling on their own. However, if you really want to try hitchhike at least once in your life, and if you do have some travelling companions with you, the countryside of Ireland is probably the safest place to start. You have a good chance of receiving a typical “warm welcome” of the Irish. In return, don’t forget to show your appreciation, and bring some little gifts with you for the Irish knights. Panpan Lin is a student ambassador for Education in Ireland. Panpan has an MPhil in Textual and Visual Studies from Trinity College Dublin and is currently working on a second Masters in Interactive Digital Media. More Education in Ireland blogs can be found at blog.educationinireland.com.